For many sleepers, buying a new mattress is an important and exciting purchase. But a mattress protector is an equally important addition that you don’t want to skip. One of the biggest draws of using a mattress protector is allergy relief. Bedtime allergies may come as dirt, natural allergens like pollen, or even dust mites. Protection from these dirty sources will help to protect your mattress and yourself throughout the night. This week, I’m reviewing the Bedcare Mattress Protector to see how it performs in our performance testing. Want to skip the review and get right to the highlights? Click here and we’ll take you straight to the review summary. The Bedcare Mattress Encasement is a 100% cotton, six-sided, breathable protector with pores that measure under five microns to provide protection from bedbugs, dust mites, dirt, and other allergens. It has a zipper closure and slips over your mattress like a pillow case. It is available in Twin, Twin XL, Full, Full XL, Queen, King, and California King and can fit mattresses up to 9″, 12”, 15″, and 18″ thick. The cotton used on this protector has a very nice feel to it, more like a high thread-count sheet than a protector. Its 100% cotton construction does mean that the Bedcare Mattress Protector is not waterproof. This is one of the biggest differences between this protector and most other protectors I have reviewed. The two main goals of any mattress protector are to provide 100% protection of the mattress without you ever knowing that it’s there. Protect without any knowledge that it’s there – A quality protector can protect from all the possible scenarios listed in #1, and can do it while staying undetected by the sleeper. It should be breathable and quiet, as well as maintain the original feel of the mattress. There’s really no way to judge in this category because the Bedcare protector is not waterproof – a fact that is a deal breaker for some sleepers. This mattress protector will not protect your mattress from any liquid spills, but could be used in combination with a waterproof protector for a double-layer defense. Click the following link to see our full list of waterproof mattress protector reviews. What the Bedcare Mattress Protector lacks is liquid protection, it may make up for in allergy/dust mite protection. The six-sided construction of this protector ensures that all parts of the mattress are protected and encased in an extremely durable barrier. While it took some work to get this protector onto the mattress, once on, it was a decent fit. There was a fair amount of play in the sizing of this protector and because it is 100% cotton there was virtually no stretch. Once smoothed and pulled taut, the Bedcare Mattress Protector is barely noticeable on the mattress. It is very thin and lacks the noisy polyurethane outer later that’s commonly used on a traditional waterproof mattress protector. It also has excellent airflow and does not affect the feel of the mattress below. One nice thing about this mattress protector is that it offers a matching zippered pillow protector made of the same material. Again, allergy sufferers, this is for you. The pillow protector uses the same breathable 100% cotton fabric to protect your pillow from dirt, dust, and other allergens. This lightweight protector is a nice addition to your pillow; however, bear in mind that this product is also not waterproof. 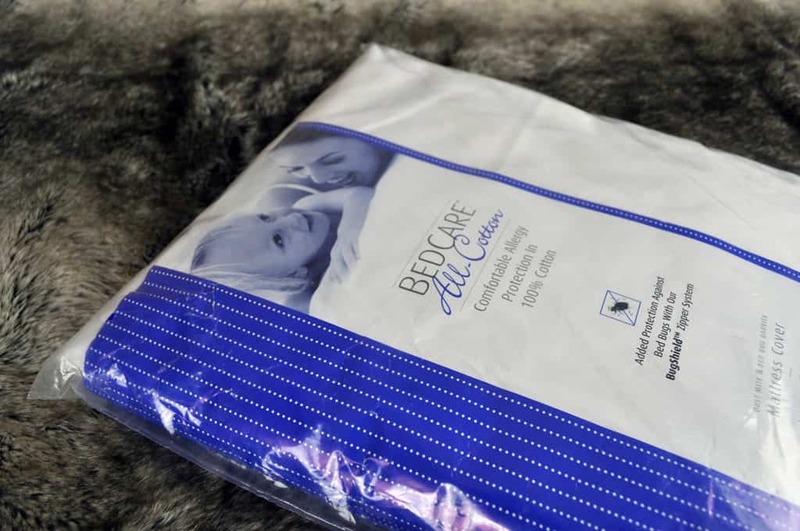 Should you buy the Bedcare Mattress Protector? 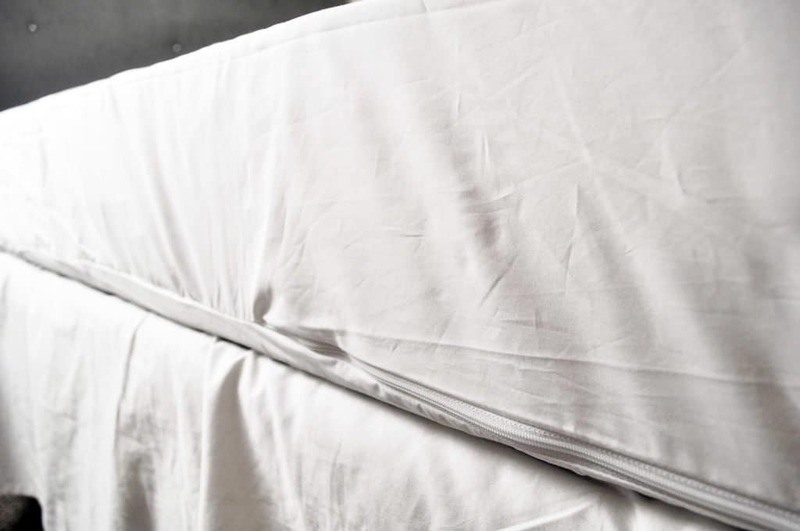 Want protection from bedbugs, dust, dirt, and allergens – You’re not going to get a waterproof barrier, but the Bedcare Mattress Protector will provide an excellent level of defense against allergens, dust, dirt, and bedbugs. Want a six-sided / full encasement mattress protector – An average mattress protector will be one-sided with elastic at the corners to keep it in place. A good mattress protector is going to be five-sided, with equal protection on the top and all four sides. 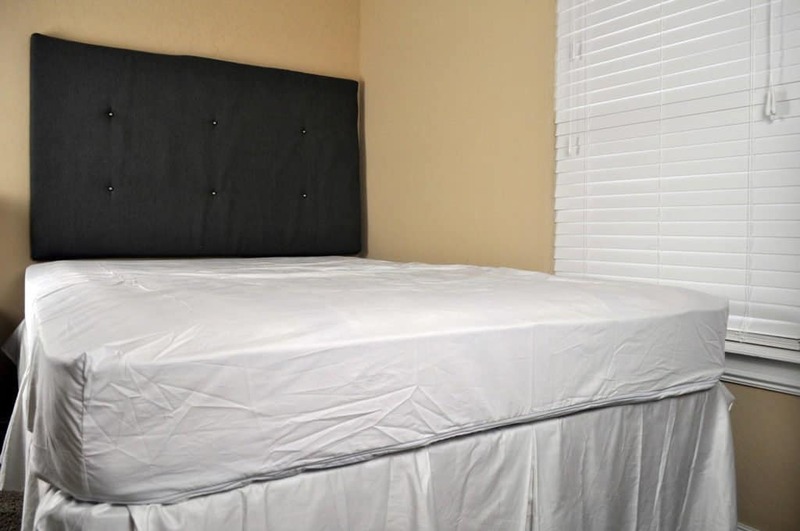 The Bedcare Mattress Protector provides defense on all six surfaces, including the sides, top, and bottom of the mattress. This is an uncommon trait in most mattress protectors. Want mattress protection + great cooling – with this protector you don’t get waterproofing, however, the lack of the waterproof feature means you improve the cooling and breathability. If liquid protection is not important to you, but cooling is, it’s a great trade off. 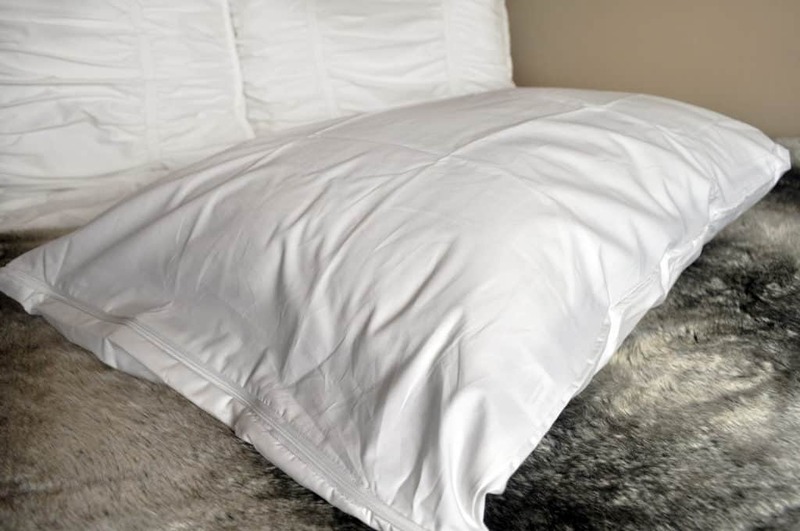 Want a zippered closure – It’s uncommon that a mattress protector would have a zipper closure. 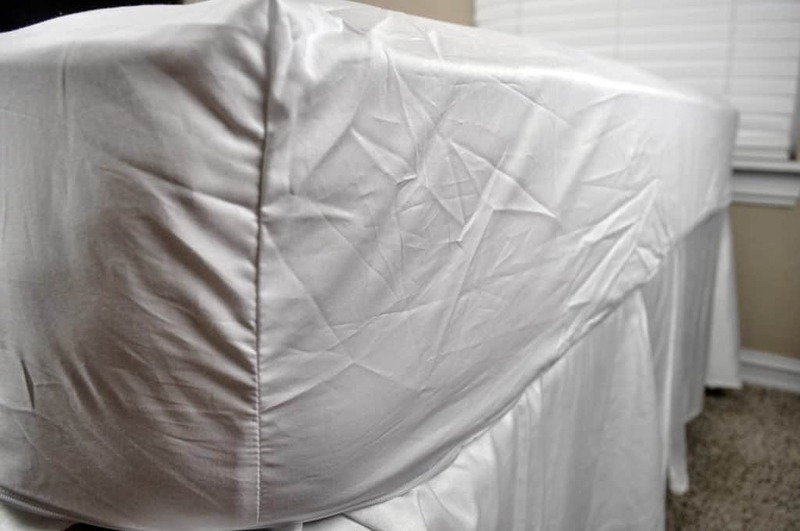 The zipper closure provides protection from allergens, allows the mattress to be moved safely, and covers any unsightly existing stains or damage on your mattress. The Bedcare Mattress Protector is made of 100% cotton and provides an excellent defense against allergies, dirt, dust, and even bedbugs. The six-sided zippered construction slips on like a pillow case and you have peace of mind knowing that it’s there, no matter how you may move at night. The main drawback is that this protector provides no guard against liquid spills. If you suffer from allergies, it may be just what you need to find relief. For non-allergy sufferers, you may want to skip the zippered protection and opt for a less expensive five-sided waterproof protector instead.